The crumbling poles of a Haida cultural site speak to visitors. By day three of kayaking in the Haida Gwaii archipelago, I’ve re-discovered quietness. The inlets, with their flapping sandhill cranes, seem to echo and vanish into the soft distance. No motorboats hurry from point to point; no other groups of kayakers dot the horizon. I’ve come here to help a tour-guide friend with a week-long trip to the 19th-century village site of SGang Gwaay Ilnagaay, best known to me as Ninstints. It’s in the southwestern part of the archipelago, perched on Anthony Island at the very edge of the continental shelf. An abundance of seafood once fostered a thriving, artistic culture—a culture so rich that the village was designated a UNESCO World Heritage site in 1981. Along the way to Anthony Island, I stretched my cramped legs in the moss-muffled forest. In places, the carpet of moss rose up in subtle, rectangular shapes, shrouding the foundations of Haida longhouses. I wondered about the people who once lived in them. I tried to picture the beaches alive with children playing, but I couldn’t. They were inescapably empty. Smallpox came and life ended. It was that brutal. The few who survived moved to villages in the north of the archipelago. We finally reach Anthony Island after a heart-pounding passage through mountainous swells. A dark, densely treed path leads to the village; even as we approach, goosebumps rise on my arms. We come into the bright clearing of the bay and the sight of the tip-tilted carved poles brings me to tears. It feels as if a great tide has washed the people away. The lonely echo is that of their lost voices. The decay is so poignant. The crumbling gray poles—once perfect—tell stories of life here. According to custom, these chapters of history close with the rotting of the poles. The poles won’t be replaced by fresh poles and fresh stories. They are dying, too. Through their death—in terrible irony—history comes alive for me. Joanna Streetly lives in Tofino, British Columbia. She has been the editor of The Sound Magazine, a contributor to BBC Wildlife Magazine, and has written four books. 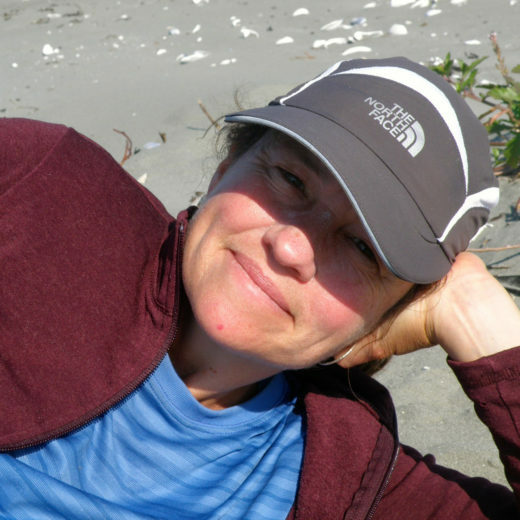 Her student years in the field of outdoor education led her to the west coast and to many years as a whale watching and sea kayaking guide. She has lived on a floathouse for 20 years. Cite this Article: Joanna Streetly “Echoes of Lives Lost on Haida Gwaii,” Hakai Magazine, Jul 15, 2015, accessed April 23rd, 2019, https://www.hakaimagazine.com/article-short/echoes-lives-lost-haida-gwaii/. A visitor discovers that British Columbia’s Village Island isn’t as abandoned as it looks. A mysterious 19th-century Haida carver breaks artistic ground and creates a rare, and stunning, portrait.